Boeing‘s (NYSE: BA) Insitu subsidiary has received a $19.6 million order from the U.S. Navy to deliver an additional five ScanEagle unmanned aircraft systems to the government of Afghanistan. The Defense Department said Tuesday Insitu will also deploy field service representatives, operators and site activation teams as well as provide spares, support equipment and program management services to help the Afghan military operate and sustain ScanEagle units. 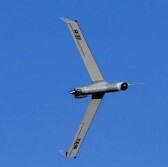 ScanEagle is launched autonomously from a catapult launcher and designed to soar above 15,000 feet, according to Boeing. The Navy will obligate the full amount of the delivery order from Afghan security forces funds at the time of award. Ninety-five percent of the work will occur in Afghanistan and the rest in Bingen, Washington. Insitu is scheduled to complete work in April 2018.